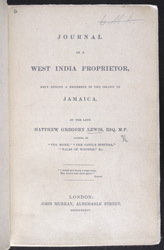 This is the title page of a work by Matthew Lewis entitled 'Journal of a West Indian Proprietor.' Lewis was born in London in 1775 and is perhaps best known for his popular gothic novel 'The Monk.' In 1812 he inherited two large plantations in Jamaica and made two visits to the country, in 1815-16 and 1817-18. In his journal Lewis describes the landscape of the island, records his observations on a variety of topics such as food and cookery, and tells stories of life on the plantations. He died at sea of yellow fever when returning to England in 1818 but his journal was not to be published until 1835.